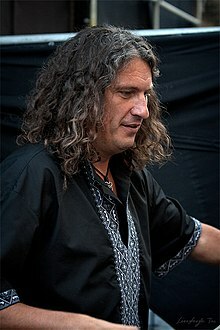 Andriy "Kuzma" Kuzmenko (Ukrainian: Андрі́й Ві́кторович Кузьме́нко; 17 August 1968 – 2 February 2015) was a Ukrainian singer. He was best as the lead singer of the rock band Skryabin, founded in 1989. Kuzmenko was born in Sambir, Lviv Oblast. He was married to Svetlana and had a daughter, Maria-Barbara, born in 1997. Kuzmenko died in a car accident on 2 February 2015 in Lozuvatka, Dnipropetrovsk Oblast, aged 46. ↑ "На Дніпропетровщині у ДТП загинув співак Кузьма Скрябін". espreso.tv (in Ukrainian). 2 February 2015. Retrieved 2 February 2015. This page was last changed on 20 August 2017, at 19:21.